You don’t remember my bed as your safe place, or when, against all odds, you fell for me. I was patiently waiting for this book. 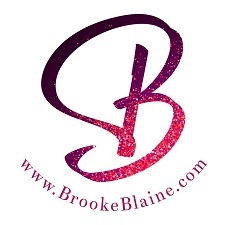 I want to thank Brooke Blaine for not making us wait too long; you made my heart melt, break, and mend. This duet is fan-flipping-tastic!!! You have to read book one first, and we all know how that ended, I think my heart stopped for a good full minute because I honestly thought something else was going to happen. So, while waiting for this book to come out, I kept imagining what would happen in this book. My imagination didn't do the book justice. My heart broke for Ollie, I cried for him. Then Reid's mom, ugh, I know she wants what is best for her son, but man, I wanted to scream at her in this book and the previous book. I don't want to give anything away because that would be wrong but let me tell you, this book is amazing. Ollie and Reid will forever have a place in my heart. 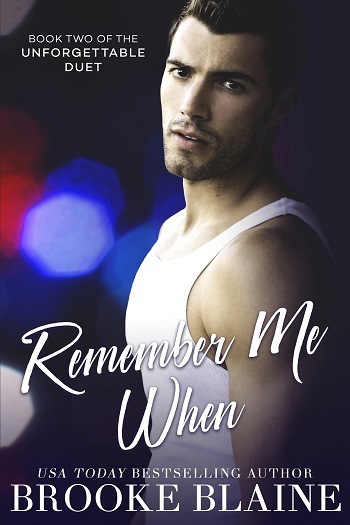 Remember Me When is book two in The Unforgettable Duet. It is imperative that you read book one before reading this book. It is a much better emotional journey to read the books in order as the author intended. After the hella cliffhanger we were left on in Forget Me Not, I couldn't wait to get my hands on Remember Me When. I had to know what happened between Reid and Ollie. Remember Me When picks up three months after Reid has his surgery. He wakes up not knowing who Ollie is. It's their worst fear come true. The accident and the weeks following are completely blocked out. Reid knows something is missing in his life, a hole, but he can't figure out what it is. Until he starts having flashes, but he doesn't know if they are real or if he's dreaming. Is Reid ready to face the truth when he finally asks about those moments? Can Ollie handle Reid's reaction to him? I loved this story. Forget Me Not left me on the edge of a broken heart but Ms. Blaine swooped in with Remember Me When to make sure it was mended. The emotions in the story are raw and real. Poor Reid doesn't know what's real or where to go to find his answers. The attachment he has with Ollie shines throughout. The Unforgettable Duet was the perfect, quick, emotionally charged read. For reviews & more info, check out our stop on the Forget Me Not Blog Tour. 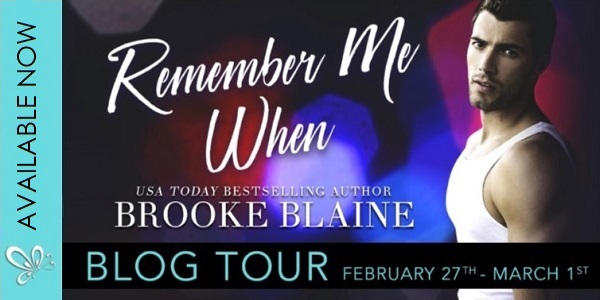 Reviewers on the Wicked Reads Review Team were provided a free copy of Remember Me When (The Unforgettable Duet #2) by Brooke Blaine to read and review for this tour.